European security and intelligence agencies are scrambling to regroup and reorganize following a steady, growing flow of jihadist atrocities. They have a steep learning curve ahead of them when it comes to thwarting terrorism. To do so, European governments will need to greatly expand budgets for domestic and overseas intelligence operations, create international security cooperation, and enable real-time intelligence sharing, on a scale not seen before. They will also need to deploy wide-reaching signals intelligence capabilities that will build up a database of leads, for monitoring and arresting suspects. Such tactics work very well against transnational terror networks which involve ISIS command centers in Syria and Iraq dispatching cells to the West, or with localized cells in Western cities acting under the influence of ISIS ideology. Yet even a country like Israel, which arguably has the biggest scope of counter-terrorism experience on Earth, has not been able to prevent a different type of terrorism, which led to a succession of Palestinian attacks that began last year. In most cases, alert security forces and members of the public responded quickly to neutralize the attackers, but the fact remains that Israel's vaunted intelligence services had not been able to thwart these attacks, and for good reason. The vast majority of "successful" terrorism that got through Israel's security net is of the "lone-wolf" kind. These are Palestinian attackers who woke up one morning, and, influenced by a potent concoction of jihadist incitement to violence and personal triggers, decided that would be the day that they open fire, run over, or stab their victims and die in the process. The organized kind of terrorism has reared its head rarely in Israel in recent months and years, due to the nightly arrests and 24-7 intelligence-gathering work that thwarts these threats, and prevents Israeli cities from turning into perpetual war zones. Organized terrorist cells leave behind tracks, such as instructions via phone calls or internet communications, the transfer of money, suspicious purchases of chemicals and weapons, and other warnings signals that can be picked up by a well-funded, hi-tech national intelligence agency with good human intelligence coverage on the ground too. The lone attacker, on the other hand, does not usually communicate with others and can easily move under the radar of national security forces, at least until now. Israeli security officials have begun employing a new weapon in the war against lone attackers: Big data analytics. This new counter-terrorism measure could prove to be equally useful and life saving in the West, where cities are increasingly being attacked by lone terrorists inspired by ISIS's murderous ideology. 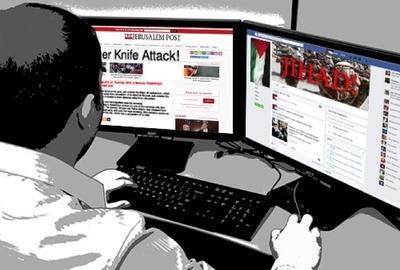 Although it is still under development, Israel's Shin Bet domestic intelligence agency and other security groups have begun using advanced algorithms to sift through a vast volume of social media activity. Their goal is to search for the small – yet deadly – needles in a haystack of online information, and find warning signs pointing to an individual who is primed to strike. The old thinking, that lone attackers do not communicate with others, may have been wrong, it turns out. They may, in fact, be communicating with the entire world through social media, and if anyone cares to listen to them attentively enough, their murderous intentions might be foiled. The precise details of this technique remain classified, but it is being used on an increasing basis by Israeli security agencies monitoring Palestinian threats. The internet remains the prime recruitment tool used by ISIS to convert Muslims in Europe into terrorists, and ISIS has expressed a preference for those keen on carrying out acts of jihad to do so on their Western home turf, rather than travel to the caliphate. Within Israel's battle against Palestinian terrorism, big data analytics have begun to work, and for the first time, a number of lone attackers were arrested before they could pounce, according to security sources. Security forces have recently issued warnings to individuals marked as potential future lone attackers, making clear the repercussions of such acts on their families. After terror attacks, the government of Israel often orders the army to demolish the home of the perpetrators. The number of lone attackers has decreased in recent months for a variety of reasons, and big data countermeasures appear to be among them. Security forces have begun monitoring Facebook pages of young people who have praised past acts of murder and express desire to become martyrs. Most of those who express jihadist sentiments do not go on to the action stage, but a minority of suspects do, and the correct algorithms can help identify them. The system remains far from perfect, and security sources say much more work is needed to improve results. It is, however, the first time that technology is being used not only to break up budding, organized terrorism cells, but also to track down and arrest the lone wolves before they pounce.